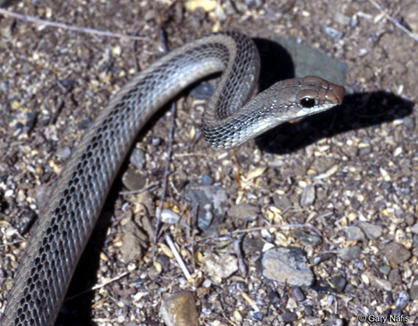 The western patch-nosed snake is widely distributed throughout the lowlands, up to 2120 m (7000 ft), of southern California from the coast to the eastern border. The species ranges north in desert habitats through Owens Valley, and also occurs in the vicinity of Honey Lake, Lassen Co. It is found in coastal chaparral, desert scrub, washes, sandy flats and rocky areas. It seems to be more common in coastal areas than desert but there is little information on abundance (Bogert 1939, 1945, Stebbins 1954). Feeding: This snake seems to be an opportunistic feeder. Reported prey items are lizards (Cnemidophorus, Coleonyx), small mammals (Dipodomys), and the eggs of lizards and snakes. It probably eats anything it can overpower (Stebbins 1954). Cover: This is an active, diurnal snake. Occasionally, it takes refuge in bushes, rock crevices and the burrows of other animals. It has been found under objects. It seems able to thrive in most environments, making use of whatever cover is available (Stebbins 1954). Reproduction: Nothing is known about reproductive requirements. Probably friable or sandy soil or the presence of rodent burrows are needed. Water: Water is probably not required. Activity Patterns: This species is diurnal. In the milder months of spring it can be found throughout the day. In summer, activity is restricted to mornings and late afternoons. Snakes may be active all year in the southern part of the state during mild to warm weather. Normally snakes are active in spring and early summer with greatest activity occurring in May and June. Reproduction: Mating probably takes place from April to June. Clutches average 5 to 6 eggs. Gravid females have been found from May to August (Fitch 1970). Laboratory incubation of eggs required 85 days (Stebbins 1954). Niche: The western patch-nosed snake is probably preyed upon by raptors, roadrunners, most diurnal mammalian carnivores, kingsnakes and other snake predators, but no records of predation are known. Nothing is known about competitors, diseases, parasites or weather. This species is widely distributed and poorly known. Bogert, C. M. 1939. Notes on snakes of the genus Salvadora with a redescription of a neglected Mexican species. Copeia 1939:140-147. Bogert, C. M. 1945. Two additional races of the patch-nosed snake, Salvadora hexalepis. Am. Mus. Novitates, 1285:1-14. Fitch, H. S. 1970. Reproductive cycles in lizards and snakes. Univ. Kans. Mus. Nat. Hist. Misc. Publ. 52:1-247. Stebbins, R. C. 1985. A field guide to western reptiles and amphibians. 2nd ed., revised. Houghton Mifflin, Boston. 336pp. ...See pictures of both venomous and nonvenomous snakes found in the Greater Phoenix area (Maricopa County) including the Western Patch-nosed Snake . This website provides information about Wildlife Around Las Vegas.